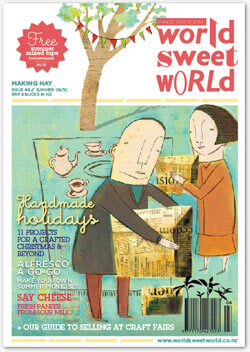 we proudly announce that the latest issue, #8, of World Sweet World magazine is out now, in shops around the country and some shops in Australia, and available from our website. Here’s a little sneak preview! We have a picnic-set project in store for you, in time for summer – have your own kit stowed in your bag at all times for emergency picnic breaks. We talk about crafty businesses again, in Miss Millie and Lucy Arnold’s article on selling at craft fairs, which is full of inspirational tips to help you get the most out of your crafty day. Also, we’re excited to report that Wellington now has it’s very own weekly craft fair – Frank Kitts Market, starting Dec 12th, underneath Frank Kitts Park on the waterfront. We’ll be there most Saturdays, so do pop by to stock up on mags for gifts, to renew your subscription, or just to say hi. Last not least, summer is never complete without a soundtrack, so we’ve rounded up a few of our favourite New Zealand musicians and compiled a summer mixed tape (free download!) for you to bike, swim and play to. We’re absolutely stoked to have such talented artists on board and are proud to be able to support their music. Tags: issue #8, music, new issue, summer mix tape, We got issues! Monday, December 7th, 2009 at 10:10 pm. Filed under Other stuff. Follow comments (RSS 2.0), comment, or trackback.